Uncle Sam tipped us off that it was coming, and now, Sonos' latest wireless streaming speaker, the Play:1 has finally, officially been revealed in black and white. How much? 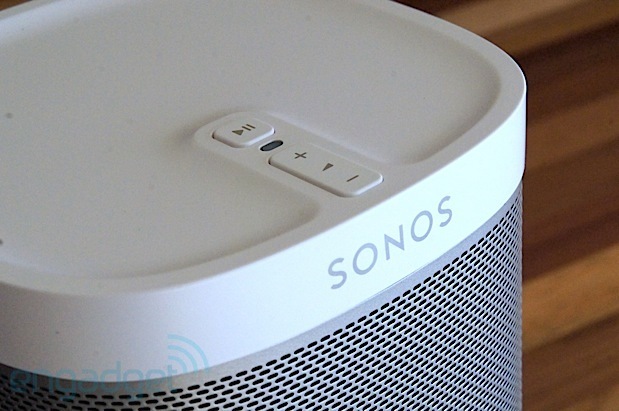 $200 gets you into the Sonos ecosystem, and from today until the end of 2013, that price nets a wireless Bridge (normally $50 sold separately) as well. So, while the last new Sonos was the largest and most expensive in the company lineup, the Play:1 is the smallest and cheapest member of the family. It's available today in the US, but will make its way to the rest of the world on October 29th. Functionally, the Play:1 the same as its elders, meaning that you connect to your network and control the thing using the Sonos app and/or the buttons on top. Speaking of, Sonos fans with a keen eye will note that a play/pause button is where the mute button should be on the Play:1, and that same button can be pressed twice to advance to the next track. (A forthcoming firmware update to all elder Sonos's will bring them the same functionality.) The Play:1 also packs an active seal design that allows its drivers a much longer throw than a normal desktop-sized speaker and a lower frequency tweeter. The company claims that combo delivers a richer sound field and deeper bass than other similarly-sized speakers. As with every other Sonos, the Play:1 packs technology that adjusts its output to fit in seamlessly with other devices in the network, so you can hook it up with another as a stereo pair or deploy it in a 5.1 home theater setup with a Playbar and Sub. To design and construct a speaker to fit in all of the components needed to both produce good sound and seamlessly knit into Sonos' proprietary wireless mesh required a team of almost 60 people. John Macfarlane, Sonos' CEO, says that the Play:1 was the most technically difficult model to build -- its small footprint (120 x 120 x 160mm) required significant engineering to deal with wireless interference and keep things acoustically optimized. And the result of their two years of hard work? A pretty damn good speaker. We were happy with the Play:3, Sub and Playbar, and we can report that the Play:1 is another quality Sonos. It performs well when playing a variety of music, from Air's "La Femme D'Argent" to James Brown's "Get on the Good Foot." Bass is accurate and tight, and vocals are crisply and clearly reproduced. Generally speaking, the Play:1 delivers a warm and rich sound. And when paired with another Play:1 using the app (Preferences>Create Stereo Pair), the results are even better. Such a configuration particularly shines when listening to songs like Purity Ring's "Lofticries" that are mixed to truly take advantage of stereo separation. In short, the Play:1's a very good solo speaker small enough to fit in almost any room, and its beautifully crafted construction seamlessly fits in most any decor. However, pairing the Play:1 with another is how it reaches its full sonic potential. ￼￼￼￼Santa Barbara, Calif. – October 14, 2013 - Sonos®, the leading manufacturer of wireless HiFi, today introduced the SONOS PLAY:1TM, a compact and powerful wireless speaker that transforms music listening at home. PLAY:1 streams all your favorite music to any room in the home, in high fidelity sound. Available today in the US from select partners and on Sonos.com, PLAY:1 retails for $199. And, for a limited time this holiday season, purchases come with a free BRIDGE valued at $49. PLAY:1 is a smart speaker that features hardware and software designed by Sonos to ensure the best possible performance for the size. A custom-designed mid-woofer and tweeter deliver deep, rich and surprisingly big sound. With a powerful low-end and crisp mids and highs, new smart processing technology pushes Sonos' drivers further than ever before, minimizing distortion even at full volume. Plus, PLAY:1 projects a wide field of sound, delivering a great listening experience no matter where you are sitting in the room. And since the Sonos wireless network is devoted to streaming music in HiFi sound, you'll enjoy smooth music wirelessly without dropouts anywhere in your home. PLAY:1 lets you stream all the music on earth and access it all using a single, easy to use app. Play millions of songs and playlists from the most popular music services like Pandora, Spotify, Hype Machine and Rdio; listen to your personal music library, whether it's stored on your computer, in the cloud, on your smartphone or on your tablet; or tune in to more than 100,000 free Internet radio stations, podcasts, and shows from around the world. • Control your favorite music sources and listening experience with the free, intuitive Sonos Controller apps for iPad® iPhone®, AndroidTM, Mac and PC. • Add more PLAY:1s or combine with other Sonos wireless speakers or components around the home for the ultimate, multi-room HiFi system. • Pair two PLAY:1 units for amazing stereo sound, or use two PLAY:1s as rear speakers with PLAYBAR and a SONOS SUBTM to create 5.1 home theater sound for your TV.